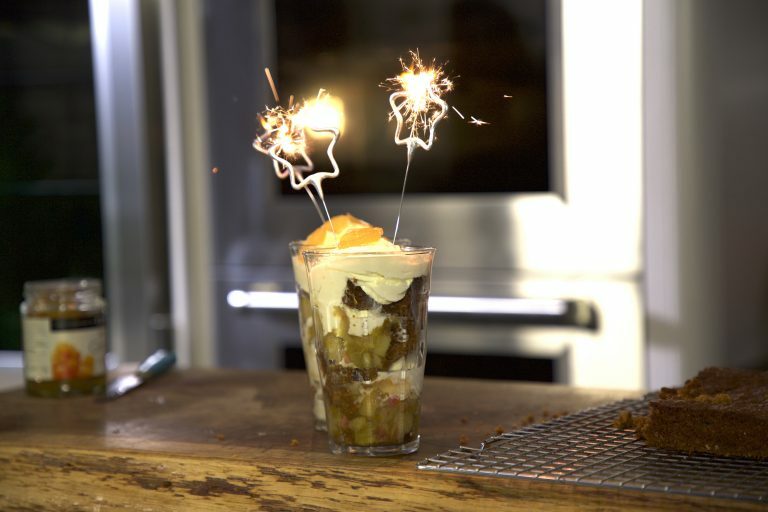 Who doesn't love the retro treat that is a Knickerbocker Glory? This one has added Parkin for an autumnal vibe! Melt the butter, syrup and treacle in a pan over a low heat. Add the milk and warm everything through. In a bowl, mix the dry ingredients together and add the egg. Whisk in the warm, wet ingredients as above. Pour into a lined square cake tin and bake in the oven at 160C for one hour. Put the rhubarb, orange juice, zest and sugar into a pan and cook for ten minutes then allow to cool. To serve, put a chunk of parkin in the bottom of a tall glass. Spoon over the compote, followed by a scoop of ice- cream, then repeat these layers. Pipe the cream on top, drizzle over the syrup, and finish with the chopped ginger.